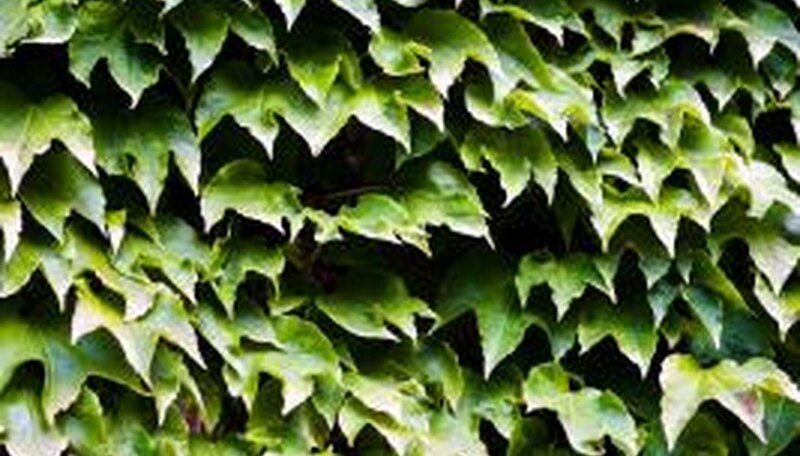 Ivy creeps along walls, old buildings, fences and many other surfaces. The dark-green shade of the vine adds color to your home and yard. The look of the ivy can be ruined, though, if you have a large number of weeds growing in your yard. With proper maintenance, it's possible to keep the ivy contained and keep it from overtaking the yard. The problem arises when you need to kill the weeds in the yard while still keeping the ivy alive. Trim down the ivy with pruning shears or another sharp object, such as a machete. Focus on any ivy currently thriving in weed-covered areas, such as along the bottom edge of any buildings where the ivy touches the weeds. Cut away any large clumps of weeds from the area, removing the top layer of the weeds. Rake the surface of the soil to create a smoother surface without any air pockets. Make sure that the tops of the weeds slightly poke through the surface of the soil. Pour warm water over the soil, saturating it completely. Wait for the water to seep over the top of the soil, and then watch for it to retreat back into the ground. Pour another dose of water over the top. This creates a warm space that helps push heat into the ground. Cover the weeds with plastic sheeting, using sheeting that's translucent in appearance. Secure the edges of the sheeting with old bricks. You can also dig around the edges of the sheeting, push the sheeting into the ground and cover the top of the sheeting with more dirt. The heat from the sun will permeate the sheeting, causing the weeds to die. Remove the plastic sheeting after eight to 10 weeks and look for signs of weeds. If any weeds remain, cover the tops of the weeds with mulch, completely coating them. The mulch forms a barrier over the weeds, thus preventing the weeds from obtaining the nutrients they need to survive. It takes longer to use this method than it does to use an herbicide, but you don't have to worry about potentially killing the ivy.